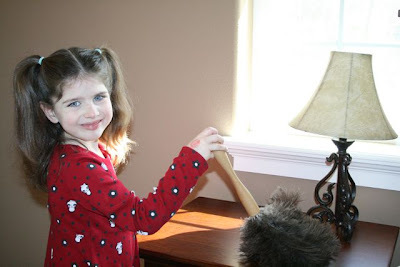 Shower of Roses: S is for Spring Cleaning! I am still working on filling those 40 Bags... I have six left, since I'm trying not to count anything that couldn't be donated (aka: trash). I'm hoping that as we Spring Clean this week we'll be able to fill them up and be finished. 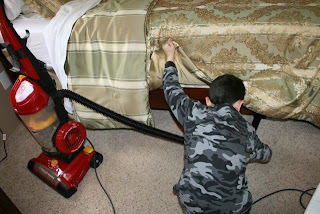 Yesterday we started our Spring Cleaning in the Master Bedroom. I figured it was the one room that had the best possibility of staying clean, so I thought it would be a good place to start. We all worked together and it didn't take too long at all. It is now the cleanest it has been since last year! 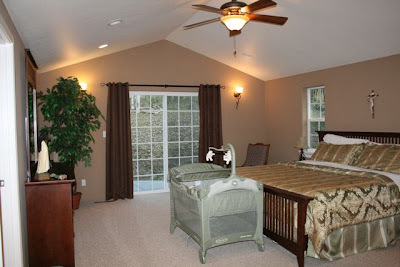 Today we are moving on to the children's bedrooms. I've spent so much time in them this past year that I'm hoping we can get all three done today... I guess we will see! You got a lot done! WD-40 might work to stop the squeak in the rocker. Use it sparingly and protect the carpet from drips. Good luck on the kids' rooms. Looks great!!! Today I am tacking the worst of the kid's rooms! Heaven help me! ...tacking... tackling, it all works, lol. Wow! Looking good! What nice helpers you've got too. Can I just say that your bedroom is beautiful? It just looks so peaceful and inviting. A cozy place for rest. Thanks for sharing the photos. And, because I ask questions such as this sometimes, do you happen to know the name and brand of your paint color in your room? I love it! I've been noticing others wall colors as I prepare to hopefully paint a few rooms in my home in the coming months. Share the color if you can!! Thanks Kelly! I will have to try the WD-40. It had crossed my mind, but I wasn't sure how it would work on wood. You are so inspiring. I seem to have a bunch of junk sitting around and I have gotten rid of 15 bags!! I'd love to hear how you declutter and how you make those difficult decisions about what to keep vs. give away. We have high ceilings too and I am wondering where you got that great duster that Captain is using. Did it come with the extension pole or did you already have that? Pauline ~ I've always been one to hang onto things "Just in case" but as I realize just how much TIME those things steal from me as I constantly move them around and "organize" I am starting to realize it is just not worth it is really helping me simplify. It is such a great feeling when a room can be picked up in 10-15 minutes, instead of taking FOREVER! I still have a long ways to go, but I feel like I am finally making progress. In my personal experience WD-40 hasn't been the best option when it comes to rockers because it eventually starts to turn gummy. (I think from the repetition, much more so than opening a door or drawer.) For our old (my great-grandfather made it) rocker I just rub a bar of soap on the creaky bits. I learned it from my mother who I'm sure learned it from hers. I hope you get the squeak to stop!